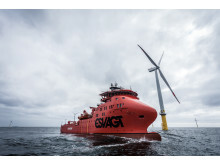 The ‘Esvagt Mercator’ left an offshore wind farm to play the role of hijacked vessel in a Belgian anti-terror exercise. The ’Esvagt Connector’ practises an emergency evacuation from a platform. ”Esvagt Gamma” reacted to an emergency call from a German supply vessel with engine failure. The vessel was towed to a safe anchorage. The ESVAGT winter specialist is part of a series of theme programmes on extreme constructions on the Discovery Channel.